Dean’s Corner Dear Colleagues: In this issue of the Alabama Medical Alumni Bulletin, we take a look at the state of health care and professional liability in Alabama and the nation. While the UASOM and its physicians are not faced with the same challenges many of the state’s smaller private medical practices face, the issue is a critical one—and of growing concern—for doctors throughout Alabama. At the same time, the UASOM continues to grow and thrive. What we have long known to be true—that many of the school’s departments, divisions, faculty, and researchers are among the best in the country, if not the world—continues to be recognized and heralded. Recent accolades and rankings include: • Jay M. McDonald, M.D., chair of the pathology department, was named the new editor-in-chief of the American Journal of Pathology, the official journal of the American Society for Investigative Pathology (ASIP). • Robert J. Stanley, M.D., professor of radiology and former chair of the radiology department, was named the new editor-in-chief of the American Journal of Roentgenology (AJR), the official journal of the American Roentgen Ray Society (ARRS). • The UASOM was recognized as one of the nation’s top graduate schools in the 2004 U.S. News & World Report rankings; in particular, the school was ranked 24th in research and 22nd in primary care. • Total research funding to UAB from the National Institutes of Health topped $200 million for the first time in FY 2002 with the UASOM receiving the greatest share—more than $176 million, a 10.2- percent increase from the previous fiscal year’s funding. Your support can help maintain and expand clinical and research facilities, programs, chairs, fellowships, and scholarships—to name just a few areas of opportunity. Through continued support of our many divisions and programs, you can help your UASOM achieve all of its goals. To find out how your support of the UASOM is essential to its continued advancement and success in all fields of medicine, please contact our development office at (205) 934-4469 or visit us online at [www.uab.edu/uasom/development]. There are also opportunities to support the UASOM and its students by way of the University of Alabama Medical Alumni Association. For more information on this, please contact Elaine Chambless at (205) 934-4463. My best to you. Sincerely, William B. Deal, M.D. 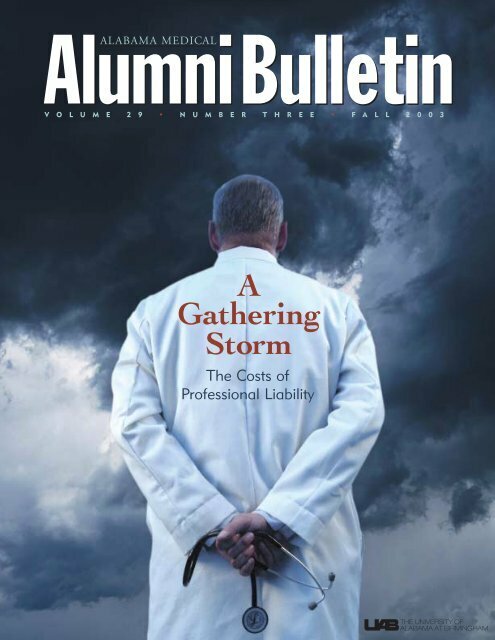 Vice President for Medicine and Dean On the Cover: A storm is brewing as physicians in the state of Alabama find themselves challenged by fastgrowing issues in professional liability. Photo by Steve Wood. ALUMNI ASSOCIATION BOARD OF DIRECTORS President Betty W. Vaughan, M.D., ’63 - Decatur President-Elect Albert J. Tully Jr., M.D., ’64 - Birmingham Secretary/Treasurer Alan R. Dimick, M.D., ’58 - Birmingham Past President T. Riley Lumpkin, M.D., ’58 - Tuscaloosa The Caduceus Club President Ronald W. Orso, M.D., ’72 - Birmingham Vice Presidents William R. Staggers, M.D., ’89 - Fairhope J. Noble Anderson Jr., M.D., ’89 - Montgomery Katherine R. Cooper, M.D., ’90 - Alexander City Bill Beasley, M.D., ’74 - Athens Karen M. Landers, M.D., ’77 - Tuscumbia Helen R. Thrasher, M.D., ’63 - Birmingham Michael G. Poist, M.D., ’87 - Tuscaloosa James S. Woodard, M.D., ’85 - Columbus, MS Betty Ruth Speir, M.D., ’63 - Point Clear Martha E. Pugh, M.D., ’65 - Houston, TX Robert M. Dimick, M.D., ’84 - Hermitage, TN Neil E. Christopher, M.D., ’58 - Guntersville Jarvis D. Ryals, M.D., ’65 - Pueblo, CO House Staff Representative Edward R. Anderson III., M.D. - Birmingham Senior Class President Darren Malone - Birmingham Vice President and Dean William B. Deal, M.D.  - Birmingham Executive Secretary Elaine O. Chambless - Birmingham Administrative Secretaries Donna F. Thompson - Birmingham Diane A. Woods - Birmingham BULLETIN STAFF Executive Editor Pam Powell Managing Editor Dawn Mesa Editor, Alumni Affairs Elaine O. Chambless Editors, Development Office John Lankford, Ph.D. Meredith Murdock Executive Art Director Ron Gamble Art Director Jason Bickell Medical Editor Julius Linn, M.D. Production Manager Lynn Lowrie Production Assistant Monica Ssenkoloto Writers Norma Butterworth-McKittrick Elaine O. Chambless Shane Ivey Dawn Mesa Photographers Elaine Chambless, Jason Norman, Brandon Robbins, Steve Wood Editorial Contributors UAB Media Relations Meredith Murdock Tim L. Pennycuff Roger Shuler Russ Willcutt AlumniBulletin ALABAMA MEDICAL AlumniBulletin University of Alabama School of Medicine, Birmingham-Huntsville-Tuscaloosa; Telephone: (205) 934-4463; Fax: (205) 975-7299; Address: MAB, 811 20th Street South, 1530 3RD AVE S, BIRMINGHAM AL 35294-2140; Executive editor’s e-mail address: ppowell@uab.edu; managing editor’s e-mail address: dmesa@uab.edu Table of Contents • Fall 2003 Issue News Briefs ...................................................................................................................... 2 School News, Faculty News, Research & Clinical News Cover Story: A Gathering Storm ....................................................................... 6 The Costs of Professional Liability The Human Genome, Projected ........................................................................ 10 Genetics and Modern Medicine Improved Evaluations ............................................................................................. 12 Inside the Multidisciplinary Spine Network Coming Home ................................................................................................................ 13 Neurology Chair Returns to UAB Adolescent Intervention ........................................................................................ 14 Addressing a New Epidemic Physicians and Scientists ..................................................................................... 14 New Developments in the M.D./Ph.D. Program The UAB Physician Services Department .................................................. 15 Enhancing Efficiency in Physician Referrals Physicians’ Forum ...................................................................................................... 16 Professional Liability Student Rounds ........................................................................................................... 18 The White Coat Ceremony From the Development Office ............................................................................ 20 Welcoming Jennifer Philpot • Gwaltney Family Endowed Chair • Programs Worth Supporting • A Reception in Point Clear • Memorial Fund for Casey • McMullan Support Fund • Hemstreet Lectureship • Comer Foundation Luncheon • Volker Hall News • Profile of Lee N. Sharma, M.D. ALUMNI ASSOCIATION NEWS ....................................................................... 24 Honors Convocation, May 18, 2003 • Class Notes • The Caduceus Club Travel Fellowship Report • Alumni Form Alumni Profile: Betty W. Vaughan, M.D. .................................................. 30 The New President of the Alumni Association Alumni Profile: Theodis Buggs Jr., M.D. ...................................................... 31 A Career Choice with Family Ties From the Archives ...................................................................................................... 32 In Memory of S. Richardson Hill, M.D. CME Calendar .................................................................................................. Back Cover Published three times a year by the Alumni Office, the University of Alabama School of Medicine, Birmingham, Alabama. Produced by UAB’s Publications and Periodicals Group, Office of Public Relations and Marketing, with the cooperation of Medical Publications, Office of the CEO of UAB Health Systems.